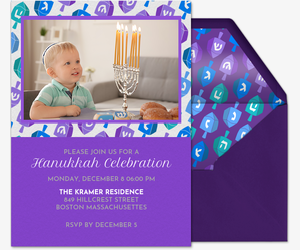 Prepare to light up the night this Hanukkah with free and Premium digital invitations from Evite. 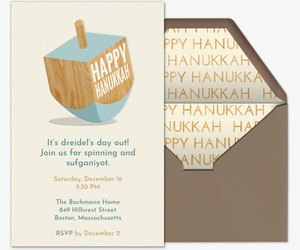 Our Hanukkah collection features festive hand-illustrated invitations for both casual and more formal gatherings. 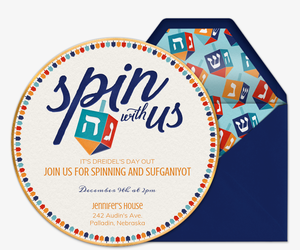 Choose from dozens of pretty blue and gold designs themed around Hanukkah activities, from lighting the menorah to playing dreidel and eating latkes. Online invitations are easy to personalize. You can track RSVPs, manage your guest list, post comments, and share photos through your invitation page before, during, and after your event. Plus, create polls or ask for guest contributions in a custom “What to Bring” list. Commemorate this special holiday with a Premium digital invitation. 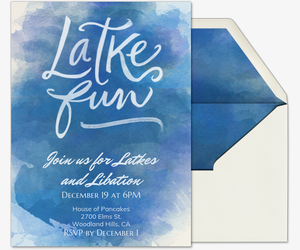 Evite Premium invitations are ad-free and come with matching envelopes and liners, stamps, and additional photo or text inserts. Pricing is determined by the size of your guest list. 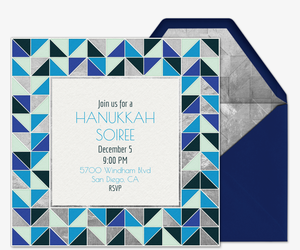 Get creative ideas for your Hanukkah gathering from Evite Party Ideas. Discover Hanukkah recipe refreshes, DIY menorahs, tablescape tips, kid-friendly set-ups, and more. Hanukkah newbie? Check out our guide to Hanukkah candle-lighting readings. Planning for a different holiday or occasion? 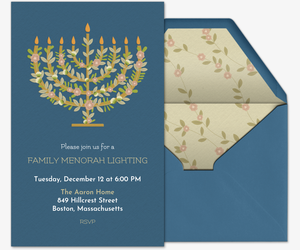 Evite also has invitations for other Jewish celebrations, like Passover, Rosh Hashanah, and bar mitzvahs and bat mitzvahs. Or, celebrate Christmas, Kwanzaa, New Year’s Eve, and other winter holidays. Evite can help you mark your milestones, too. Browse our invitation collections for birthday parties, baby showers, weddings, and more.